The eight annual A Handmade Assembly, hosted by the Owens Art Gallery and Struts Gallery & Faucet Media Arts Centre with support from the Fine Arts Department at Mount Allison University, featured workshops, talks, and projects by Carrie Allison, Hassaan Ashraf, Chris Boyne, Paige Gratland, Robyn Love, Kristie MacDonald & Ella Tetrault, Kristin Nelson, Graeme Patterson, Sarah Quinton, Lisa Schroeder, and Negar Tajgardan. Sackville Curling Club, 22 Lansdowne St. The Assembly activities began with an Opening Night Roundtable Discussion moderated by Adriana Kuiper with Hassaan Ashraf, Robyn Love, Kristin Nelson, and Lisa Schroeder. Participants each shared a short presentation on topics related to the handmade in contemporary culture as it relates to their own research or art practices, followed by questions from the moderator and audience. Guilty Pleasure Data Gathering will explored the ways looking for images online can inform the process of making. 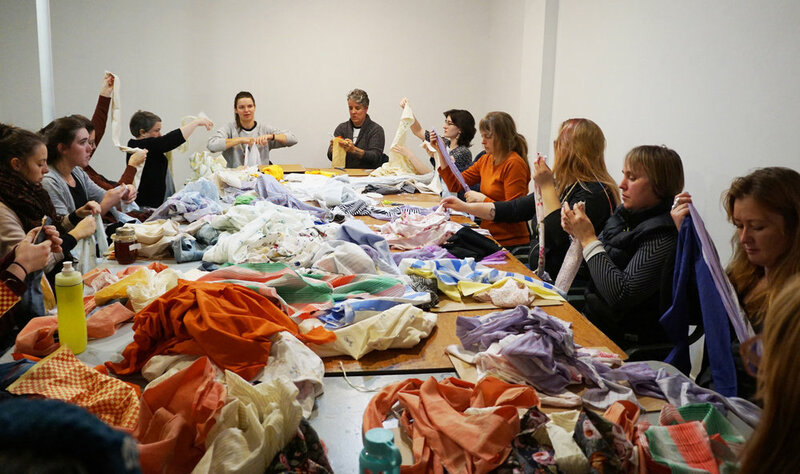 Over the course of three hours, the group explored image-data collection as a pathway to subject matter for art and craft or as a work in and of itself. 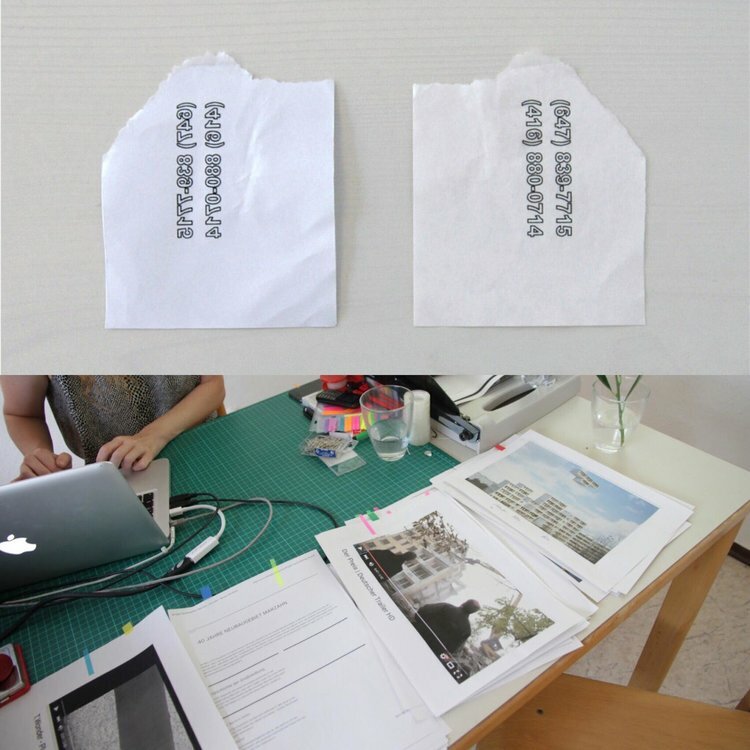 Through discussion and the production of print-out collages, participants were provided with the space to consider how they collect and relate to images. Using printers, paper, scissors, and glue participants moved the images they locate from online sources to handmade collage. Participants left the workshop with a new collection of source material and a small artwork, as well as new tools and strategies for discussing the role of data-image collection. Carrie Allison’s presentation focused on beading as a way to build connections, looking at her latest projects 150, Sîpîy, The Shubenacadie River Beading Project and Beading Treaty. These projects center pedagogy and research, and seek to engage participants in body and mind. Allison discussed her journey to beadwork and how it has become a central practice in her artwork, both personally and socially. This workshop explores making as pedagogy through a collaborative beading project. Beading Treaty is a community collaborative project beading the individual words of the Peace and Friendship Treaty of 1725. This act of making will encourage participants to engage in dialogue about the Treaties of Peace and Friendship. Giving non-Indigenous participants space to contemplate their role in reconciliation and shared responsibility, and Indigenous participants space to share their individual perspectives. Search Engine Serendipity is a collaborative artist project by Ella Tetrault and Kristie MacDonald. It explores the process of locating, selecting, and interpreting images online, and the tangential paths we navigate to find them. Taking the form of an internet travelogue, the website is a hyperlinked collage of found and created images, video clips, search engine results and live-streams, juxtaposed through intuitive logic and thematic associations. This workshop will bring the colorful gift of Pakistani kite-making to the participants and will educate and inform them about the beautiful Basant Festival which is the kite flying festival of Pakistan and it’s the celebration of coming of spring. They will also learn the political reality of the Basant Festival and how the Pakistani government banned the festival over fifteen years ago and the beautifully simple act of kite flying was made illegal. The participants will learn to make different kites of different colors and how to fly these kites. Owens Art Gallery, 61 York St.
Search Engine Serendipity: Browsing for Images as Intimate Labour was a collaborative artist talk between Kristie MacDonald and Ella Tetrault, which sought to work through the relationship between digital image collection and making. MacDonald and Tetrault explored common contemporary strategies for locating and interpreting source materials online. They co-presented an illustrated discussion that described methodologies used in their individual practices, and explored the work of other artists and craftspeople who engage in similar practices. Most of us have attempted to render an object on paper using observational drawing at one point or another. What would happen if we didn't use our eyes in that process? In this drop-in workshop, paper and drawing materials will be provided. Bring an object to draw or use one that will be on hand. The only condition is: no peeking. Using touch, smell, sound or taste, can you express the object on paper? The ability to see is a wonderful, powerful thing but, in many ways, it also limits how we perceive the world - things become ordinary and easily overlooked. Let's change that up and let even the most boring object come alive in a new way. Negar Tajgardan spoke about her interests in Memories and Displacement through her recent artworks. Sometimes the memories of places we lived before make it hard to settle down elsewhere. Through her artwork, she is attempting to indicate the ideas of vulnerability and instability as a result of displacement and how they affect the quality of our lives. Her works relate to the idea of displacement through her personal experiences as someone coming from Iran to study in Canada. Royal Canadian Legion, 15 Lorne St.
drink is an overt commentary on our precious natural resources and the effects of our consumer culture on them. Disposable cups were woven by hand, and in cotton on a floor loom, by some of Riding Mountain National Park’s most stunning lakes and in the artist's studio. Kristin Nelson invites you to have a drink to help in the continuation of a new art installation on display at Neutral Ground (Regina) in December, 2018. A Handmade Assembly came to an end on Saturday evening with a closing address delivered by Sarah Quinton. Quinton is the Curatorial Director at the Textile Museum of Canada. She has worked in Toronto’s visual arts community for 25 years as a cultural administrator, curator, educator and artist. She has curated over 30 national and international exhibitions, with cultural inclusivity, social awareness and accessibility through education and community outreach at the forefront. Her curatorial practice includes benchmark projects that have come to define a discourse that focuses on complex intersections between art, craft and design. On the strength of this interdisciplinary arc, she is often called upon as a speaker, advisor, mentor and advocate in Canada and abroad. Quinton has taught and lectured at museums, galleries, universities and colleges in Canada, and regularly participates as a juror and advisor at universities, colleges, galleries, museums and non-profit arts organizations throughout Canada, the United States and internationally. She is widely sought for her expertise as a juror for international and national art exhibitions, national, provincial, regional and local arts councils, and has sat on numerous volunteer boards and advisory committees. For A Handmade Assembly, Chris Boyne presented the task-based project seventy-six through a story-telling lecture. seventy-six seeks to substantiate lost and fictional memory bits through the hand fabrication and manipulation of objects. Some of these memory bits may not be real—many of them are only parts of ideas, fantasies or dreams. Others do not even belong to the artist but they have all become part of an amalgam of idea and memory. The bits are varied and include searching for 2L pop bottles with opaque black bottoms, turning a soup spoon into a pike, baking blackstrap molasses bread and finding a trunk key to a Plymouth Duster muscle car. Learn some of the basics of rug braiding. Participants will be supplied with fabric, needles, thread and instruction on how to use these techniques for both functional and non functional projects. There are always certain objects for us that are associated with some memories. In this workshop participants are asked to bring a photo of an object they face every day or have memories of. Based on their chosen objects they will have the opportunity to make a small replica of that object using Paper Solvy (a dissolving material) and wire. Afterward, objects can be sprayed with water to dissolve the fabric like a memory that fades away. Secret Citadel explores the trials and tribulations of male friendship through an experimental stop-motion animated narrative by Sackville artist Graeme Patterson. Guided by a variety of subtle gestures and intense interactions, an anthropomorphic bison and cougar create a bond that spans all stages of maturity. Playful creativity brings them together while violent awkwardness tears them apart. Eventually the extremes of their relationship create a semi-automated existence as their various animated and live-action forms venture through a self-referential world. Image: Still from Secret Citadel, 2013, digital video, 29:48 minutes, edition 1/5. Purchased by the Owens Art Gallery with funds from the Ruth Eisenhauer Bequest. Craft your own leather souvenir by learning basic techniques used in traditional cowboy boot design. Each participant will: translate an image into overlay and inlay, create traceable stencils, use a skiving knife to bring a piece of leather to a feather edge, cut, assemble, glue, hammer your very own commemorative Handmade Assembly themed leather emblem. The workshop will introduce sewing with a roller foot; if equipped, feel free to complete sewing at home, or have your instructors finish and promptly mail back to you. No previous experience required. Materials included. Workshop limited to 10 participants. Struts & Faucet’s current Open Studio artist-in-residence, Robyn Love, has been collecting well-worn objects from community members for her project, Reliquary. She then transformed them, tapping into their stories and energy to create something new. The newly transformed objects will be sold in a silent auction that will end on Saturday, October 20, at 10:00 PM during the closing reception of A Handmade Assembly. Proceeds will go towards the Open Studio international artist-in-residence program at Struts & Faucet.